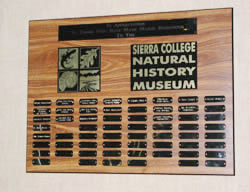 A major donor recognition plaque is mounted in the Museum foyer. Come see the names of many of the people who have made possible the exhibits in the museum. Rebecca Gregg of the Sierra College Photography Department for support for the Native American artifacts case. Patricia Whalen of Loomis donated an impressive personal collection of taxidermy mounts. Two were used to upgrade the prior African antelope collection and three more (Black wildebeest, Lechwe and Reedbuck) were additions. The duplicates are being loaned to the local high schools to strengthen their instructional programs. The American pronghorn, Rattlesnake skin and skeleton and male Mallard duck went to Woodcreek, Bison to Del Oro, Red Hartebeest to Granite Bay, Oryx to Lincoln, Nyala to Placer, Impala to Nevada Union. There is room for your name, so please help. Contributions can be made through the Sierra College Foundation. The Sierra College Foundation qualifies as a non-profit, charitable organization under IRS Sec. 501 (c) (3) public charity status for federal income, estate and gift tax purposes.